This Saturday a group of QPR fans are walking 15 miles from Loftus Road to Watford Town's ground on Vicarage Road to (hopefully!) get there in time for the away game kick-off. With a promotion tantalisingly close, there is a real buzz around Shepherd's Bush at the potential prospect of hosting Barclays Premier League teams at Loftus Road and so this is the perfect time to promote some of the other achievements of QPR Football Club. Registered charity QPR in the Community has the sole aim of using its power, reach and influence as a family and community football club to give back to and form strong connections to local residents and supporters. They should be proud to say that QPR won Community Club of the Year Best Disability Project in 2011 at the Football League Awards. One of their projects is QPR's Tiger Cubs. Set up in 2008, QPR Tiger Cubs provides weekly football training for youngsters with Down's syndrome, it is one of the only clubs in the South East offering this and it is for this very worthy cause that 30 people will be heading north to Watford on Saturday. One of the Tiger Feet Walk organisers, James, told me that he was inspired to help Tiger Clubs after seeing them play during half time at a home game against Barnsley in 2009. 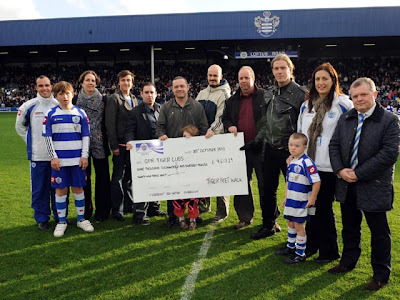 He told me that he spoke with fellow QPR fan and friend Chris, whose daughter has Down's syndrome, about organising an event and impressively in April 2010 thanks to James' and others' hard work a very successful walk from Loftus Road to Selhurst Park raised over £9,600. Thanks largely to the money raised last year QPR Tiger Cubs now holds a second branch of football training sessions in Brent and they also offer sessions in tennis and golf. This is a project run by dedicated, enthusiastic members of the QPR community and I hope the support they receive reflects this. You can sponsor the walkers by clicking here. They also have a facebook page here, which will feature updates and information. James has also provided me with this link for those who want to see the route that they Tiger Feet will be marching along, click here. It's a long old way through Harlesden and up past Harrow includeing a photo stop at Wembley Stadium. They will definitely deserve a sit-down by the time they take their seats for kick-off. 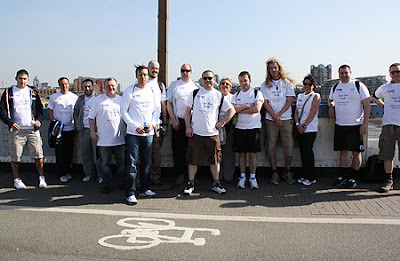 They are setting off at 7.30am on Saturday morning (30th April 2011) from Loftus Road and any well-wishers who want to wave them on their way are more than welcome and their support will be much appreciated. I'm sure they'll also be easy to spot on the journey to Vicarage Road, so I hope they have many car horns and cheers of support from fellow Rangers to keep them going. Their walk ends with a well-deserved lap of honour before the match. With QPR's destiny potentially being decided on the same day, who knows where they'll be walking to next year - Old Trafford??! Good luck Tiger Feet walkers! A special thank you to James for providing me with photos and information. I look forward to hearing what the final sponsorship and blister count totals are!